In the late 1960s and the 1970s, when moving image was making its way into the gallery in a big way as 16mm film started to be replaced by video, they often took a pretty descriptive approach to titling work. Bruce Nauman’s film and video works of that period – a number of which are on show in the North Gallery of White Cube Bermondsey at the moment as part of the Inside the White Cube programme – are simply made and descriptively titled and driven by Nauman’s assertion that as an artist, everything he made in the studio must surely be art; an argument that works well enough for Nauman himself but one which is immediately undermined by the collection of Damien Hirst paintings on display here in the South Galleries, which I wrote about yesterday. 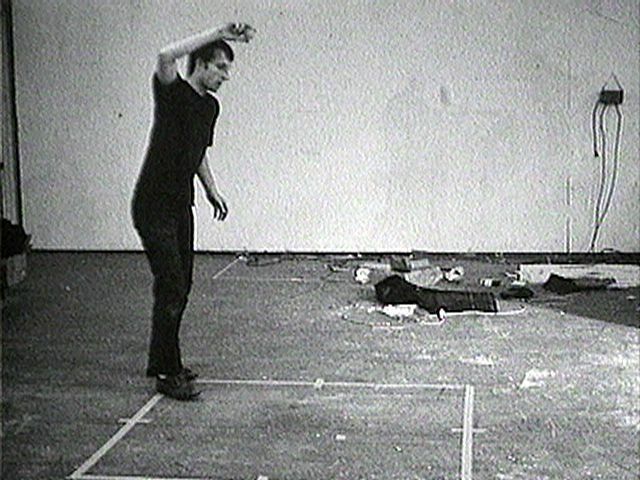 In each of these works – some shown on monitors, others projected – Nauman is engaged in making a simple, repeated action in front of a static camera. Given the way the world of moving image has changed in the last forty years – both in terms of artists’ film and narrative cinema – our understanding of film-based art is very different now. We can immediately decode sophisticated visual effects and understand the ways in which these affect our response to what we are watching. Watching Nauman’s early films and video pieces now, it’s hard not to be charmed by the combination of conceptual earnestness and frivolity that drives the works. In terms of the White Cube show and its timing to coincide with Hirst, two things interested me in particular. Firstly, as already noted, the disparity between Nauman’s understanding of his practice as automatically art – which I’m all too happy to concur with until faced with the awful reality of the cheesiness and poor artistry of Hirst’s paintings – and secondly the approach to titling. In each of these works, Nauman uses the title to describe the action taken in the studio when making the work. These are highly experimental works by an artist at the start of his career set on exploring both the media available to him and his own ideas about the possibilities of the body, performance, repetitive gesture and, I suppose, ultimately, the human condition. Hirst’s titles list the subject matter in a way which is somewhat similar although he is – perhaps predictably – less rigorous. Nauman’s approach is of its time – plenty of other conceptual artists of the 1960s and 70s adopted similar strategies – Hirst’s seems strangely at odds with his other works and somehow seems to add to the sense that, however much he thinks he wants to paint and feels that it’s a medium in which he has something to say, ultimately he can’t help himself: lacking the determination to master the medium, he’s phoning it in. Bruce Nauman is at White Cube Bermondsey until 8 July 2012. 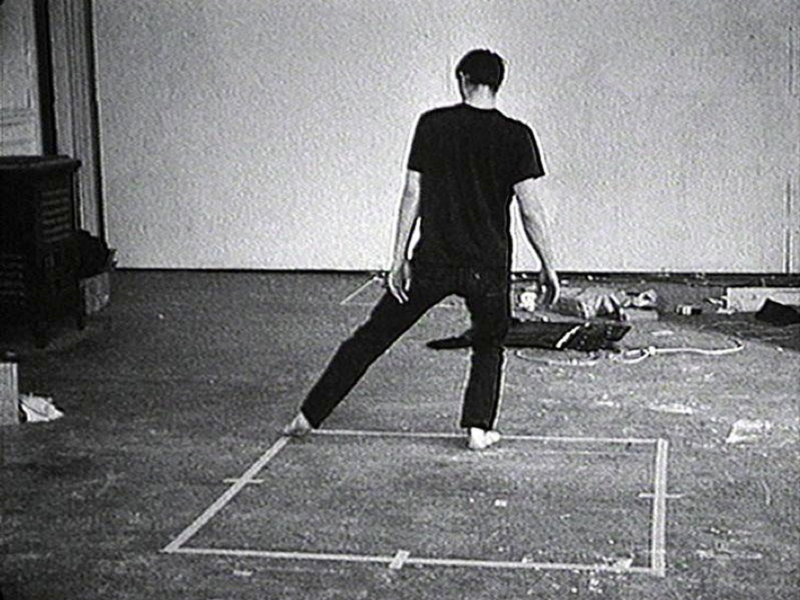 This entry was posted in Film/Video, Ideas and tagged art, Bouncing Two Balls between Floor and Ceiling with Changing Rhythms, Bruce Nauman, Dance or Exercise around the Perimeter of a Square, film, Inside the White Cube, Slow Angle Walk (Beckett Walk), video, Walking in an Exaggerated Manner around the Perimeter of a Square by Ann Jones. Bookmark the permalink. Repetitions of sequences in a way that could almost be a dance or could almost be mechanical are really stunning to watch. I recently saw an exhibition featuring James Coleman’s video installations and was hypnotized. Nauman forces the audience to reevaluate what is “natural”, small acts like “walking” become features. Thanks for the post. You’re absolutely right about the way Nauman makes us reevaluate ideas about what’s natural. With these works things like walking and foot stamping become both fascinating and strange. I don’t know James Coleman’s work at all well (the odd review but I’m not sure I’ve actually seen any in real life). Must try to check him out properly.